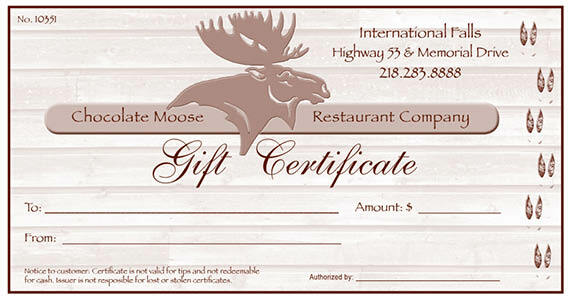 Gift Certificates | Chocolate Moose Restaurant Co. When it comes to gift giving, think big. Moose are big. And Chocolate Moose gift certificates are always greatly appreciated, no matter the occasion – whether it's for a birthday, anniversary, holiday – you name it. Gift certificates are available for purchase at the restaurant! 2018 © Chocolate Moose Restaurant Company. All rights reserved.